"What every gold dredger should know - Part 2"! Dave McCracken has so much knowledge about gold dredging to share, he couldn't fit it all in one book! 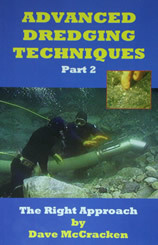 Improve your dredging techniques in deep, cold, or fast waters, and learn some handy tips and secrets of the trade. This book is a 5.5" x 8.5" paperback with 224 pages.